Last Sunday night, Oakland's eclectic Rooz Cafe saw four phenomenal Bay area bassists take the stage to the delight of all. From the classical stylings of the up-and-coming Dave Lockhart; Celtic-Afro funk of Ariane Cap; the ECM flavored virtuoso Edo Castro; to Randy Marshall and his brainchild: "The Solo Bass Night" series. A member of the California Bass Alliance, Marshall "networks with other bay area soloists to bring the bass guitar into the limelight". Amazingly, he does an admirable job of bringing together some of the Bay area's best bassists in a monthly movable feast of looping, bowing, thumpin' and pluckin' good fun. The show began with Marshall's now familiar foray into the world of the soloing bass player. A truly great bassist in his own right, Marshall's enthusiasm is tempered only by his humility and love of all things bass. His "Bass Solo Night" series are a thing to behold and fertile ground for bassists of all stripes, shapes and colors. Marshall played selections from his latest CD "Gravity", (Digital Garage label), a delightful and worthy effort. His lyrical playing and textured tones also showed an affinity for the late, great guitarist Michael Hedges. Quite a feat to bring that kind of feeling to the bass. Marshall's lilting "Thin Blue Line II" is a fabulous example of his gorgeous style of plucking; The driving "Phallacy" will have you tapping your feet to a truly infectious groove and I am at a loss to explain how he plays "Bolero" on a bass. Marshall has such a guitar-like quality when he plays it that for a moment or two, I forgot I was listening to a bass! Marshall's passions aren't limited to just his array of 5-string basses and wondrous effects. Heath Care, the issues of global warming and living in sustainable world are also high on his list. Marshall writes in his recent blog, "As more evidence of climate change continues to mount, it becomes harder and harder to deny the changes taking place all around us. Awareness of our planets health is becoming a daily spot on the news, and even businesses are trying to figure out how to operate in a more earth friendly fashion. There is one industry however that seems to be still operating with it's blinders on when it comes to global consciousness... Health Care." "What's being completely ignored in the wake of all that, is just how much health care in general contributes to pollution and global warming. Do you all have any idea how much plastic is wasted every single day inside a hospital? You would gasp if I were able to go into real detail on it. Realize that because of the sterile and clean nature of everything we use to care for patients, we open "single use" plastic items and toss them when we're done by the thousands every day in just one hospital. If you think grocery stores giving out plastic bags is bad, and it is... you would keel over and die if you knew how much raw plastic is being spit out into your environment everyday by your local hospital.... and thats not to mention all the bio waste we put out..."
Castro's incredible ability to loop during his solos and use an Ebow to generate guitar-like sounds was nothing short of remarkable. His song "Remembering" was absolutely beautiful and truly reminded me of the works of another fantastic bassist: Eberhard Weber and his work on John Abercrombie and Jack DeJohnette's classic ECM album "Timeless". Following Castro was Vallejo-by-way-of-Austria's Ariane Cap. 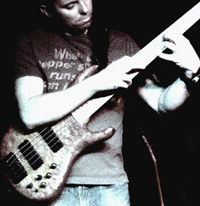 A protege of legendary players like Kai Eckhardt and Victor Wooten, Cap has performed with the Celtic group "Tempest" and is one of the most sought after bassists in the Bay Area. Don't let her gender fool you; as Wooten himself remarked to me recently, "Oh man, this girl can play!" Cap plays in a myriad of groups, including Richard Lindley's popular 'Palm Wine Boys" Born and raised in Austria, Cap has been musically active since a very early age. "Steeped in classical music," recalls Cap. "I played piano and other instruments until I found the bass. Electric and Upright became my main instruments. I studied Jazz Bass Education at the University of Music in Vienna, Austria, where I finally received a scholarship to attend the University of Miami for jazz studies for a year. (What an awesome school!!). I received a Graduate Certificate of Music in 2000 from USF in Tampa, Florida. I fell in love with the possibilities the States have to offer to a musician and managed to put my roots down in California." Bach, funk, african or celtic, Cap is at home with all of them and her solo pieces are a wonderfully crafted reflection of her worldly travels. Closing this particular night was the youthful Dave Lockhart, whose blend of Bohemian jazz meets French classical on the double bass was mesmerizing. At first glance, one might mistake Lockhart for a hip-hop bassist, ready to throw down on a Digable Planets CD, or Modeski, Martin and Wood, however Lockhart's solos took the audience through a history of modern, post-classical styles, with a dash of South America and a hint of Bach. Afterwards, Steve, the proprietor of the Rooz Cafe confided in me, "Lot of great talent in here tonight, really great talent". I couldn't agree more. Marshall and his revolving cast of bassists, featuring Edo Castro, Jeff Schmidt, Andres Cervantes and "Jimbo", will be at the Nomad Cafe in Berkeley on Shattuck, March 22nd for "Solo Bass Night II" and return to the Rooz Cafe in April. You don't have to be a bass player to appreciate these fine Bay area bassists, just a love of music and an open heart. with Andy Cervantes, Edo Castro, Jeff Schmidt and "Jimbo"